I rigged a U.S. East Coast to Singapore flight so that I could have a three day stopover in Dubai for relatively the same price as the direct flight. The dates coincided with New Years and as an added bonus, Dubai would attempt and break the World Record for largest fireworks display as part of their year end celebrations. The only question was where to celebrate and observe the world record performance? Atlantis, The Palm which was having a beach party or in a public space at Dubai Mall and Burj Khalifa, the tallest building in the world. The Atlantis party entrance fee was only $60 USD, however, I thought it could be a major headache leaving the event since the Dubai Beach Resorts are not serviced by the city’s metro system. 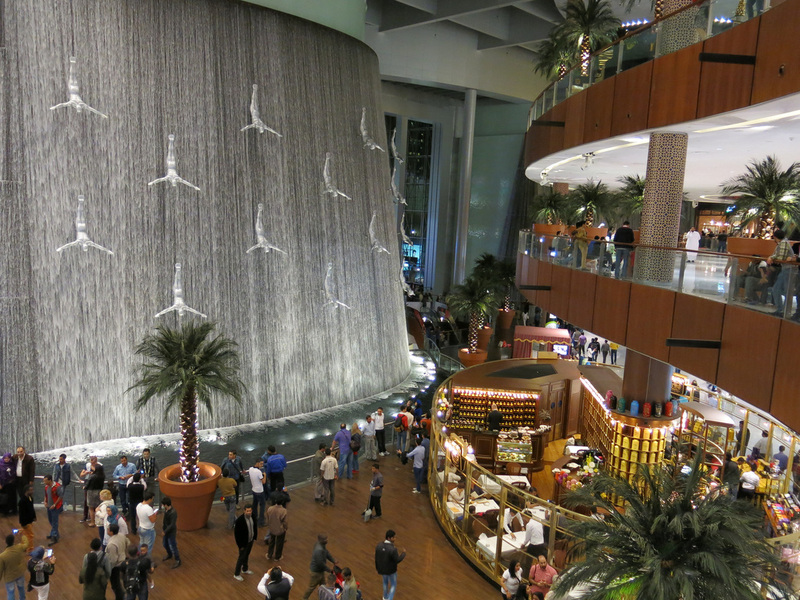 It would be much easier to return from the metro serviced Dubai Mall. The 2014 New Years celebration started smoothly. I decided to head to the Jurmeirah / Palm area first and tried to enter the Burj Al Arab hotel...the two billion dollar sail shaped hotel that “introduced” Dubai to the world. 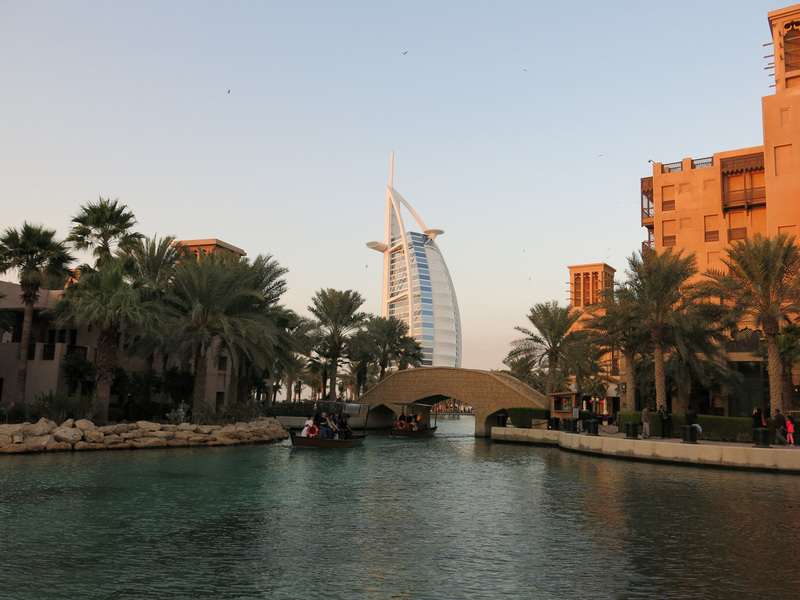 Unfortunately hotel security prevents non-guests from entering the complex so I walked over to the nearby Madinat Jumeirah hotel for better views. This hotel has a large common restaurant and shopping area, that’s designed to look like a souk, and is open to the public. I grabbed an outdoor seat and drank a coffee to watch the sunset and lights go on at the Burj Al Arab. It was still a relatively serene New Years scene when I rode a taxi to Dubai Marina later in the evening, although traffic was starting to form heading in the opposite direction towards the Palm Island complex. I knew at that point it would be a disaster to reach my hotel in the Burjuman area later that night if I celebrated at Atlantis. I had a light Persian dinner at one of the restaurants along the Marina promenade. Around eight I started for Dubai Mall. Slight panic started as the metro car approached the Dubai Mall station. Even though it was clear everyone on board was exiting at this stop, people started pushing and shoving to leave before the metro doors opened. Complete pandemonium awaited at the entrance / exit gate one level below. Crowds twenty deep were trying to pass through the turnstiles. It took nearly fifteen minutes to exit the metro station - every two to three minutes a new wave of passengers descended upon the gate level and pushing and shoving ensued. As I left the metro station and entered the pedestrian overpass to Dubai Mall I was directed into the “Bachelors” lane. The “Bachelors” concept may be distinct to Dubai, Abu Dhabi, Qatar, and other places with a high influx of male construction workers. Over the past twenty years, Dubai has literally risen from the desert...mostly on the backs of cheap foreign laborers, primarily Indians and Pakastanis. Of Dubai’s 2.1 million residents, nearly 71% are Asian migrant workers. 75% of the population are men. When there's a major event, like New Years, the "Bachelors" have their own entrance separate from women and families because of the overwhelming disparity. Event security decided to follow the letter of the law and direct me down the Bachelors path even though I did not exactly fit the spirit of the law. The walk started well with the Bachelors lane and Family lane proceeding side by side, then all of a sudden, the Bachelors lane was directed down an emergency fire escape and I began wishing I had just tagged along and pretended to be with a larger group to join the Family lane. Walking with the laborers I realized Indians and Pakastanis move at a single speed - slow. If you are walking at a medium or fast pace you will easily overtake them. It also means that if you reach a chokepoint, say a set of doors, and need to stop, the Indians and Pakastanis will catch up...yet they continue at the same slow pace pushing and shoving you from behind as though they have no ability to stop. Bachelors pushing and shoving was starting to become a trend for the night. The fire escape led to a street level area and from there I was on my own to find my way to Dubai Mall. I eventually made my way to the mall and spent some time there until 10:30 when I started to follow the signs to the fireworks viewing area. I reached the viewing “pen” around 11:00 - all the areas around Dubai Mall seemed to be under construction. The outer walls of the viewing area were ten foot high, construction zone, plywood boards. There was only one way in and out of the viewing area thus once you were there, it felt like you were in a pen. At this point it would have been a futile attempt to turn around - the crowds were so strong moving into the viewing area that it would have been impossible to make an escape. The next hour felt like an eternity - every five minutes I checked my watch and realized only a minute had passed. More and more people entered the viewing area. Every time people inched closer you thought - this is as tight as it can get - then they inched closer again. If you had your hands on your waist with elbows out, then put your arms at your side, the pack collapsed around you. People who were in front of me earlier, were now behind me, yet I never saw anybody move. Once I took a deep breath and when I exhaled I had less space...I’m not exaggerating. Every so often a chain of people would plow through, sometimes using a baby stroller as a cattle prod, to reach a group of friends somewhere else in the mayhem. Twice an ambulance drove through and everyone in the crowd would press against one another. After every chain of people and ambulance passed it felt like there was less space than before. Midnight was approaching and I let out a sigh of relief...not too long though for fear of the pile of people collapsing further upon me. The fireworks were impressive. Whether it was a world record performance or not did not seem to matter - watching fireworks shoot of the sides of the Burj Khalifa is easily the most creative use of fireworks I’ve ever seen. Fireworks "crescendoed" up and down the tower running like a pianist fingers over piano keys. The fireworks lasted just over eight minutes - I looked down and my watch thought that seemed a little short of a performance and while the first eight minutes were the most impressive display I’ve ever scene there wasn’t a big bang finale. The fireworks were a powerful sprint with no lulls to catch your breath. Everyone else in the crowd seemed to share that thought. There was a ten second lapse between the last firework and when the crowd realized the performance was over. At the ten second march there was a surge in the crowd and I could start to feel people pushing and shoving. I looked around to see who the impatient jerk was and saw no one in a pushing position. Instead the surge was pulsating from somewhere deep and couldn’t be seen like an ocean current pushing instead of dragging. The pushing and shoving from before seemed like nothing compared to the earlier Metro Ride and Bachelors Lane sensations. I started to panic and looked for an area to escape flow of the crowd. If I remained still I would get have been caught up in the crowd instead of people passing by. I spotted the ambulance about fifty feet away and knew if I made it there I could get behind the far side and use the vehicle as shelter. During that fifty foot stretch there were a few times where I’d take a step and before I could put my foot down, the crowd surge lifted the planted foot. Fortunately I always managed to land again. It was an effort but once I reached the ambulance I knew I’d be safe from the crowd. That fifty foot interval was the scariest moment of my travels - it’s the only time with a real and imminent danger and the threat of being trampled. I waited behind the ambulance for fifteen minutes before the crowd started to dissipate. During that time several other people joined my rank including a woman who collapsed - fortunately a few people in the crowd helped her to her feet and safety. I waited another fifteen minutes and by now the area was clear. I walked in the opposite direction of the exits to the VIP area and sat on a parking guard for another thirty minutes before heading to the exits. I thought that an hour after the end of the fireworks it’d be a gentle walk...I was wrong. When I reached the exit corridor there was still a crowd across the corridor and in length as far as I could see. I eventually reached a Dubai Mall entrance, ducked inside, found a cafe, and ordered a cappuccino to kill another hour. I started to make my way back to the metro station around 2:30 thinking that at this point the crowds have surely cleared...again I was wrong. I needed to re-join the Bachelors exit lane, this time it lead through a parking garage. I was walking up rampways avoiding cars wondering where the directional arrows would lead. I reached the same street level area I walked through after leaving the fire escape earlier in the evening. I looked up at the glass pedestrian walkway and could see crowds backed up trying to enter the metro station. 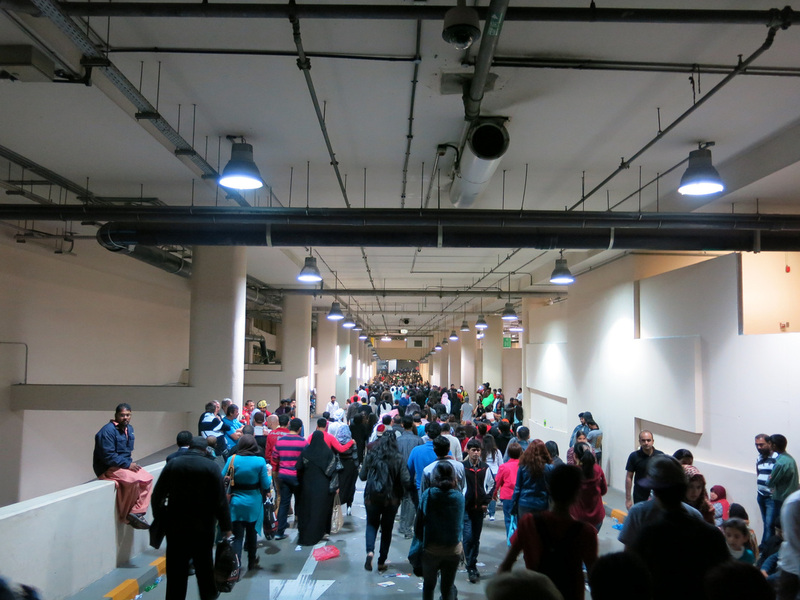 It looked like a nightmare scene and rather than join another large crowd in a pen I stayed at street level and walked toward the metro station hoping for an alternative entrance. The street level metro station entrance was just as backed up and did not appear to be moving. Then I had a nice change of luck. I spotted a row of buses - the buses were making a stop at Burjuman, where my hotel was located. I was the first onboard and grabbed a seat. It was still another thirty minutes to Burjuman, however, I was able to let out a sigh of relief...without having to worry about the crowd collapsing.